It’s Super Bowl Sunday so no one outside of Glendale, Arizona scheduled any events today. But there’s a quiet anniversary I’m happy to celebrate before and after the game. One hundred fifty years ago today, the Territorial Legislature granted a charter to a small group of community-minded folks in Steilacoom, WA. That document started the first public library in what became the state of Washington. It’s a respectable milestone. Institutions back east might look upon Feb. 3, 1858, as downright recent, but it was still early pioneer days in the Pacific Northwest. The village of Seattle was less than ten years old and Washington statehood was still thirty years off. 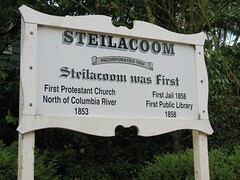 The library tradition up here started in the bustling Puget Sound town of Steilacoom. Happy 150th birthday, Steilacoom Library. You started a library tradition in the state … and in me. P.S. I could elaborate on local history (it has always interested me) but I’ll share just one feature about that first library that seems quite remarkable now. The 1858 charter called for the establishment of three things: a library of books, a reading room, and public interaction. They wanted a participatory library even then! It was written into the charter: “Procuring public lectures, essays and establishing debates.” Way to go, pioneers! This entry was posted on Sunday, February 3rd, 2008 at 3:03 pm and is filed under personal. You can follow any responses to this entry through the RSS 2.0 feed. You can leave a response, or trackback from your own site. Just had to share this update: We use the Polaris ILS. When Polaris heard that our first-in-the-state library was having a big birthday, the company sent flowers to the branch. Out of the blue. Admit it: some vendors are kinda cool.